2. Remove front (left side) seat. Refer to SE-27, "Removal and Installation". 3. Remove floor carpet. Refer to INT-23, "Removal and Installation". 4. Remove G sensor. Refer to TM-282, "Removal and Installation". 5. Disconnect 4WD control module harness connector. 6. Remove 4WD control module mounting nuts. 7. Remove 4WD control module. • Perform “G SENSOR CALIBRATION”. Refer to TM-182, "Description". • When installing 4WD control module, install it following procedure. 1. Align the securing holes (A) of bracket as shown in the figure and temporarily tighten mounting bolts. 2. 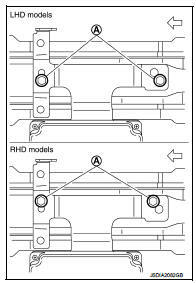 When replace 4WD control module, hold 4WD control module and remove protector paper on the adhesion area of bracket to bond to the front floor (LH). 3. Tighten mounting bolts to the specified torque. • When replacing 4WD control module, perform writing unit parameter. Refer to DLN-39, "Work Procedure".